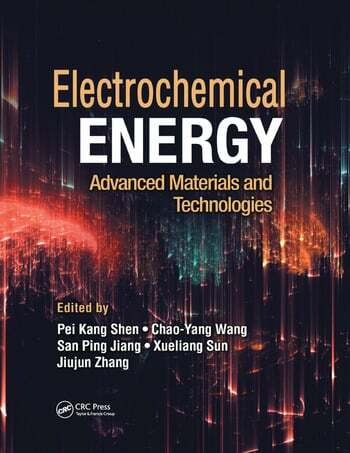 Electrochemical Energy: Advanced Materials and Technologies covers the development of advanced materials and technologies for electrochemical energy conversion and storage. The book was created by participants of the International Conference on Electrochemical Materials and Technologies for Clean Sustainable Energy (ICES-2013) held in Guangzhou, China, and incorporates select papers presented at the conference. Comprised of eight sections, this book includes 25 chapters featuring highlights from the conference and covering every facet of synthesis, characterization, and performance evaluation of the advanced materials for electrochemical energy. It thoroughly describes electrochemical energy conversion and storage technologies such as batteries, fuel cells, supercapacitors, hydrogen generation, and their associated materials. The book contains a number of topics that include electrochemical processes, materials, components, assembly and manufacturing, and degradation mechanisms. It also addresses challenges related to cost and performance, provides varying perspectives, and emphasizes existing and emerging solutions. The result of a conference encouraging enhanced research collaboration among members of the electrochemical energy community, Electrochemical Energy: Advanced Materials and Technologies is dedicated to the development of advanced materials and technologies for electrochemical energy conversion and storage and details the technologies, current achievements, and future directions in the field. Pei Kang Shen obtained his BSc in electrochemistry at Xiamen University in 1982. He received his PhD in chemistry at Essex University in 1992. From then on, he has been working at Essex University, Hong Kong University, the City University of Hong Kong, and the South China University of Technology. Since 2001, he has served as a professor and director of Advanced Energy Materials Research Laboratory at the Sun Yat-sen University, Guangzhou, China. He is the author of more than 300 publications. His research interests include fuel cells and batteries, electrochemistry of nanomaterials and nanocomposite functional materials, and electrochemical engineering. Chao-Yang Wang is William E. Diefenderfer Chair in mechanical engineering and distinguished professor of mechanical engineering, chemical engineering, and materials science and engineering at the Pennsylvania State University. He has been the founding director of Penn State Electrochemical Engine Center since 1997. Dr. Wang holds several patents and has published two books. He has more than 12,000 Science Citation Index citations, an h-index of 65 (Web of Science), and is one of 187 highly cited researchers in engineering named by Thomas Reuter in 2014. His research interests cover the transport, materials, manufacturing, and modeling aspects of batteries and fuel cells. San Ping Jiang obtained his BEng in ceramic materials from South China University of Technology in 1982 and PhD in electrochemistry from The City University, London, in 1988. He is a professor at the Department of Chemical Engineering, deputy director of Fuels and Energy Technology Institute, Curtin University, Australia, and adjunct professor at University of the Sunshine Coast, Australia. Dr. Jiang has authored and coauthored 10 book chapters and three books, and published approximately 270 journal papers. His research interests encompass solid oxide fuel cells, proton-exchange membrane and direct alcohol fuel cells, water electrolysis, solid-state ionics, electrocatalysis, and nanostructured functional materials. Xueliang (Andy) Sun is a professor and Canada Research Chair (Tier I) for the development of nanomaterials for clean energy, at the University of Western Ontario, Canada. Dr. Sun received his PhD degree in materials chemistry at the University of Manchester, UK, in 1999. Then, he worked as a postdoctoral fellow in the University of British Columbia, Canada, during 1999–2001. He was a research associate at the National Institut de la Recherche Scientifique, Quebec, Canada, during 2001–2004. Dr. Sun’s research is focused on advanced nanostructured materials for energy conversion and storage, including fuel cells and Li batteries. Jiujun Zhang is a principal research officer at the National Research Council of Canada and a fellow of the International Society of Electrochemistry. His expertise lies in electrochemistry, photoelectrochemistry, spectroelectrochemistry, electrocatalysis, fuel cells (polymer electrolyte membrane fuel cells, solid oxide fuel cells, and direct methanol fuel cells), batteries, and supercapacitors. Dr. Zhang received his BS and MSc in electrochemistry from Peking University in 1982 and 1985, respectively, and his PhD in electrochemistry from Wuhan University in 1988. He serves as the editor/editorial board member for several journals and as series book editor for Electrochemical Energy Storage and Conversion, CRC Press. "It covers a wide range of topics in the area of electrochemical energy storage and conversion ... It can be used as a reference for courses on energy storage and conversion. It can also be used as a reference for researchers in the field of electrochemical energy storage and conversion." "This book is put together by an excellent team of editors who are leading scientists in the field of electrochemical energy storage and conversion, covering a wide spectrum from designing advanced materials to developing cutting-edge technologies in the field." "This book is perhaps the most comprehensive collection of expert explanations and in-depth reviews of various electrochemical energy technologies and the associated materials… Having researched in the area of materials electrochemistry for over 30 years in both the UK and China, I have not yet seen a book as comprehensive and in-depth as this one in coverage… I therefore strongly recommend this book…"
"… an excellent review… good coverage … I appreciate the hard work from the authors…"
"This single book is designed for most of [the] electrochemical energy conversion and storage technologies, not only for students, but also for those who are engaged in all energy technologies. This is [a] one-stop source for most of all, electrochemical energy technologies."